A 5,000-Year Testament To Human Adaptation Faces Imminent Burial. "This is it," says my guide, raising his voice over the traffic on the Bayshore Freeway. "This is where they lived." He stoops down and picks up a handful of soil. The handful contains hundreds of fragments of broken shells, as much shell as dirt. He points to a spot over a hundred yards away, "We're at the south end," he says. "It ends around there." We are standing in a valley meadow at the base of San Bruno Mountain, between Brisbane and South San Francisco. We are separated from the freeway by a couple of billboards, some patches of broom littered with trash, and a rusty chain link fence. Although the shellmound is larger than a football field, it takes a couple of minutes to distinguish the outline of the mound against the hillside. The weather is warm, but for a second I shiver. People lived in this place for over five thousand years. David Schooley, my guide, is a cheerful sunburned man in his fifties, who has been fighting for thirty years to preserve San Bruno Mountain from development. In the process, he and his allies have spotlighted an enormously important challenge for environmentalists: not only to preserve one of the last remnants of a traditional bayshore ecosystem--but to respect the human life it once sustained, recognizing a manner of living that thrived for millennia. "It was just a perfect site," Schooley says. "They had everything: fresh water, shellfish, buckeyes. Buckeyes are supposed to be inferior to acorns but I've eaten them. They're OK. There are oaks further up the canyon, anyway. It's an easy hike to the ocean from here, so they could have brought back abalone. And the Bay is calm here. You couldn't cross at the Golden Gate, but you could cross here. This was a big center. People probably came here from all over for trade and exchange." This 5,000-year-old shellmound at the base of San Bruno Mountain has become the latest focus of a long and at times bitter struggle to prevent development on the mountain. On one side stands SunChase GA, a development company based in Arizona, which has begun construction on an elaborate three-part development called TerraBay. The project's last phase would transform the shellmound site into a commercial complex. On the other side of the issue stand environmentalists, concerned neighbors, a number of Ohlone descendants, and Schooley's organization, San Bruno Mountain Watch. In the middle is an archaeological report, buried by the developers for eight years, that has radically changed the terms of the debate. The South San Francisco City Council is deciding whether to complete TerraBay, and in what form. An Environmental Impact Report (EIR), incorporating the updated archaeological report, was released July 1, with a public comment period expiring August 14. It is working its way through the planning commission and public hearings, as Schooley's organization stands ready with an attorney. This is a high-stakes decision. The shellmound is unique, one of the few remaining untouched shellmound sites around the bay--and one of the oldest. But the property on San Bruno Mountain has become extraordinarily valuable precisely because it is the last large, undeveloped space on the bay between San Francisco and San Jose. In its decision on the fate of the site, the council will go to the heart of urban land issues, biodiversity, Native American dignity, and California social and natural history. Council members must wade through 400 pages of the EIR, but the decision comes down to three distinct perspectives on the significance of the site: It's a lucrative opportunity for tax revenue for South San Francisco, a windfall for archaeological excavation and study, or a chance to respect the spirit of people who lived their lives on the site and were buried there. It is all but impossible to do all three. On the land around the shellmound, SunChase proposes to construct about 300,000 square feet of buildings, including three hotels with up to 200 units each, four restaurants, retail outlets, and mixed-use structures, including offices. In January, the developer submitted plans to cover the mound with 20 feet of fill and man-made material, on which to build a two-acre parking lot and a park surrounded by the buildings. Neither scale nor location of the proposed buildings is final yet. But as planned, the overall development not only would damage the local ecosystem, host to 22 rare and endangered species including the San Francisco garter snake, Diablo rockrose, and Mission Blue butterfly. It would also destroy forever the natural state of an ancient human adaptation to that ecosystem. If the hotels are built, there will be no turning back. The plan would devastate the biodiverse valley and "cap" the site-- depriving archaeologists of a rich source of study. "I want to see the site preserved," says councilman John Penna, an amateur archaeologist. "I would prefer to see it studied. It contains important scientific data that has to do with the ecology of the area. Why did the oysters leave the bay for 1,000 years and suddenly reappear, and then why did the shrimp leave and then come back? That shellmound tells us that that happened. It may have the secrets. Test boring should be allowed." There are other bayside shellmounds, "but this is one of the last," says Miley Holman, the site's archaeologist who found fragments of human bones and suspects the site contains intact burials. 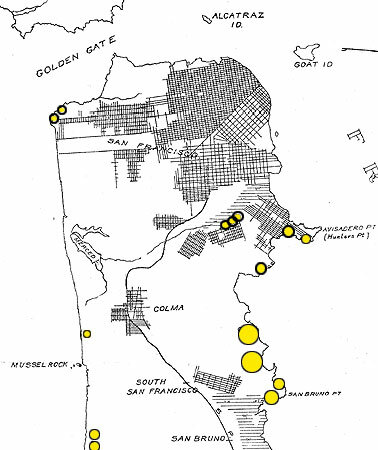 While it is not clear whether the site was the 100-120-person village "Siplichiquin," referred to in Mission Dolores records, it is a safe assumption, says Holman, that the village was inhabited until the missions were built and was probably continuously occupied for its 5,000-year life span. "The site was a seasonal village and probably a main village of local inhabitants, lived in for a major portion of the year," he says. "It's essentially intact. There is dietary, artifactual information." Holman says the site's artifacts, including obsidian, a hearth of cracked rocks, knives, beads, and quartz-crystal drills, represent a prime example of the kind of complex, highly-adaptive, enduring culture described by Alfred Kroeber, the anthropologist who laid the basis of much of our understanding of native Californian life: "The permanence of Californian culture," Kroeber wrote in 1925, "is of far more than local interest. It is a fact of significance in the history of civilization." "The ideal would be total avoidance," Holman says. "(Archaeologists) are bound professionally to seek preservation even from ourselves. The best would be to preserve it in toto, protect it from vandals. But if development goes forward, we want to salvage some information for the archaeological record." The fill plan under consideration would make salvage impossible, because its weighty covering would "take it out of reach and would result in compression," he said. Archaeological scholarship is not foremost in the mind of Patrick Orozco, headman of the Pajaro Valley Ohlone Indian Council. "People forget the meaning of spirituality, of respect," he says. "They look at this with scientific interest, as if it's about dinosaurs. I don't. We have gathered enough (cultural knowledge) from our relatives. That's where it should be left. If the kids want to learn," he says, mentioning as an example an Ohlone educational village near Watsonville, "they can learn from us." Archaeological study would require digging up human remains, a desecration that is "going on at an alarming rate," says Orozco. "I don't believe in going along with it. What if it was somebody today? Just think about it: If they went over and dug up your grandmother without your consent, how would you feel? It affects your mind." Orozco's sentiments are akin to objections of religious groups in the Middle East to excavations that disturb ancient sites, Penna says. "We must respect the religious rights of individuals, but (the San Bruno site) is not just a human burial ground. It's burial ground for the many (ecological) phases of the area. It's an archaeological site like those normally studied throughout the world. Why should this one be any different?" To Orozco, the shellmound is not just another archaeological site. Visiting the valley early this year, he hiked around with Schooley in the rain and spent a number of hours alone, perched on a hill above. "I could feel it," he says, recalling some of the rituals that would have been performed on the site. "Much praying was done, ceremonials were done, cry songs for the funeral and dances were done. I can still hear their songs. I could hear their crying. When you went on that land, you could feel that much praying was needed. I could feel it, see it in the land." Amid the shells, Orozco saw fire-cracked rocks the kind used for cooking or for heating sweat lodges, which he guessed would have been situated along the site's small stream. "I went up on the hill, taking all this in and asking the creator, Tararuc, for guidance in singing the songs in a respectful way for the people before me." In 1975, Orozco participated in Watsonville's Lee Road uprising, in which Ohlones stopped development of a warehouse that would have desecrated the cemetery Orozco's grandparents had counseled him to remember and protect. Above the San Bruno shellmound, the feeling returned. "Right there and then, the thought came to me. It must be preserved. Grandmother's words came to mind, 'Do what you have to do.'" Ella Rodriguez, another Ohlone who has worked to preserve Ohlone sites for over twenty years, spent a couple of months as Holman's on-site observer of a 1989 archaeological sampling. "I have a very strong feeling for the site," she says. "I walked the site. I actually lived adjacent to it in a trailer. It was a peaceful feeling. I felt at home. It's hard to explain, but the past feelings were there." "To the Europeans, it's a garbage dump. To the Native Americans, it's not. It was traditional to the Native Americans to bury their people in the shells. It was like giving back to the earth what they had taken. It would avoid disturbance by animals who would smell the old sea shells. When you're there you get the feeling that you're back into the past. It made me feel wonderful. Not everyone can walk on the site or near the site and feel an extra sense of belonging and feel like it's part of you. I'd like to see it totally preserved. That's all." "We believe that the whole area should just be left as it is," Schooley says. "Just leave it be. It's right next to the San Bruno Mountain State and County Park. It would fit right into it. We should leave the whole valley where there was a living village for 5,000 years. The kids who live here know nothing about the native habitat and how the Indians lived here. This is the last chance to have a sense of a real living habitat." A replica village could be built above the site, adds Orozco. SunChase's plans are quite different. In 1996, Environmental Exchange Company, a mitigation banking outfit that buys ecologically-sensitive property to conserve it, offered $2 million to SunChase so that the shellmound's valley could be attached to San Bruno Mountain State and County Park. Needless to say, SunChase refused the offer. Nearing completion on the southwest side of the mountain are 286 homes in Phase I of TerraBay. TerraBay II, under review, would build 350 more residences on the southern and eastern slopes. An earlier incarnation of TerraBay III on the eastern slope would have obliterated the shellmound with a freeway exit ramp. After a public outcry, SunChase proposed the "fill" plan for parking lot and park, offering few details. But it did not abandon plans for the commercial complex. As owner of the land, SunChase is required by California law only to "mitigate" damage to an archaeological site. "Mitigation" in this case is an elastic term that could include the sort of landscaping that SunChase proposes. If a dig commences and turns up human remains, SunChase would be required to contact the Native American Heritage Commission for a "most likely descendant" to consult about removal. There is no known direct descendant of any l8th-century Ohlone registered at Mission Dolores, where villagers on the Peninsula were forced to resettle. Before the 1970s, when archaeologists began consulting more with Native Americans, human remains often ended up in universities, museums, and other scientific institutions. TerraBay was first dreamed up in the late '80s by WW Dean & Associates of San Mateo, then owners of the land. The company contracted with the archaeological consulting firm of Holman & Associates (H&A) to prepare a report on the archaeological significance of the property, a process required by state and federal regulations before a site can be developed. During May and June of 1989, H&A hand-excavated and analyzed 22 cubic meters of the site, which contains many thousands of cubic meters of material. In December 1989, H&A issued a report that probably did not sit well with the principals of WW Dean. The archaeologist who prepared it, Matthew Clark, concluded unequivocally that the shellmound area was an "important site" as defined by law and should be treated as such. Moreover, five of the six samplings contained human remains. Clark stated that disruption of the site would "necessarily disturb possibly dozens or hundreds of human burials" and called for "coordination and cooperation with the Native American community by all parties involved in the work." But then in the early '90s the archaeological report fell from sight. It was buried when Dean's development company's source of funds, the financially troubled Great American First Savings Bank of San Diego, was shut down by the federal Resolution Trust Corporation (RTC). According to a city planning source who wished to remain anonymous, the RTC sold off the mortgages on the property, and SunChase bought them. Dean still owned the property, and the archaeological report was in draft form, not legally ready for release. CalTrans had a copy because it regulated the proposed highway ramps to the site, but could not release a draft copy. After SunChase purchased the mortgages and foreclosed on Dean's debt despite his appeal for delay, says the source, the RTC refused to allow the report's release, claiming it was private property. Holman was legally bound not to release an unofficial draft version, and the report was never submitted to the city. The RTC refused even to respond to inquiries about the report, according to Holman. Around 1993, Dean's parcel of property reverted to mortgage-holder SunChase, which continued the TerraBay project. By 1996, South San Francisco resurrected for SunChase an old development agreement it had reached with Dean, and prepared a supplemental EIR minus the missing Holman report. A spokesman from SunChase later claimed in an interview with the San Jose Mercury News that the purchase had included the understanding that the archaeological issues had been resolved. In 1997, eight years after it was written, the draft report was obtained through unofficial channels by Mountain Watch, which began distributing copies. The terms of the debate around the shellmound changed. With knowledge of the site's archaeological significance prior to the initial approval of TerraBay, "I think there would have been a different set of circumstances," Penna says. It was 1982 when the TerraBay gained general approval, setting in motion the first residential construction approved in 1989, along with a process for approving TerraBay II's additional residences and TerraBay III's commercial component. With evidence of archaeological significance, "they may have gotten some approval, but maybe not. Maybe the county would have bought all this property and created a park. That's a huge, huge piece of land," says Penna. In February 1998, Holman's updated archaeological report was finally released to the city's consultant, who approved the research and incorporated it in the draft EIR. In addition to the impact of the project and ways to mitigate it, the EIR notes that the site is eligible for nomination to the National Register of Historic Places. One recommendation is to leave the whole valley as permanent open space, sparing it the hotels and retail complex, a position previously outlined by the Historic Preservation Commission. The South San Francisco City Council, in the view of most observers, decidedly favors commercial development to occupy the village site. One city planner went to the root of land-use issues when questioned whether the city might choose open space for the shellmound valley: "This is not a valley," she put it, "it's a commercial site." All along, the council had looked to TerraBay's last phase, with its focus on the shellmound site, to recoup some of the costs of TerraBay developments to date. TerraBay I and II, the residential phases underway, have sapped resources. While the developers paid for the infrastructure of roads, sewers, gymnasium and fire station, the city shoulders tens of thousands of dollars in ongoing costs, mostly in recreation staffing for the gym. But while the city might be counting on TerraBay's commercial site as a tax generator, critics wonder whether the hotels would suffer from low occupancy. They predict a glut of new competitors. "The flatlands area (will be) overhoteled as it is," says Mountain Watch's Vicky Graham, who noted that a proposed 55-acre development, Shearwater, would operate directly across the highway, bringing five hotels to South San Francisco, along with a 20-acre car dealership and 15 acres of retail outlets. Right next to Shearwater would be South San Francisco's and Brisbane's Sierra Point site, featuring two proposed hotels, bringing the number of hotels in TerraBay's immediate neighborhood to at least seven, according to Jim Harnish, South San Francisco's chief planner. A total of 2,000 rooms are already proposed or approved in the vicinity of TerraBay, Harnish said. "They're putting so much sprawl on the flatlands already," says Graham. "I want to know: Why can't they get the tax revenue from that and leave the shellmound alone?" Our friends at the East Bay Yesterday podcast put together a wonderful show on the fight (in 2018) over the Berkeley Shellmound. Here it is.